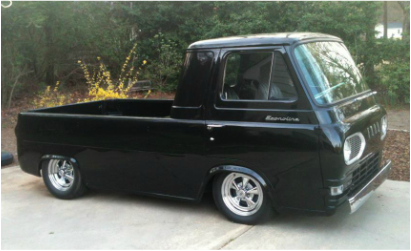 Built from 1961 thru 1967, this is body style that started it all for Ford Motor Company. Occasionally referred to as "forward control" vehicles because brakes, transmission linkages and steering boxes were forward of the engine, the first Econolines, like the sixties Dodge and Chevys, located their engines between the front seats, housed in a "doghouse". The domestic exception is the Corvair van series, which featured air-cooled rear engines. The Corvair vans and pickups met an untimely demise when the Corvair platform was trounced by consumer advocate Ralph "unsafe at any speed" Nader. Meanwhile, the first-gen Econolines came with 6-cylinder engines in a variety of displacements. As light-duty vehicles, were often used as fleet vehicles for light industrial and mom-and-pop applications. Bell Telephone used a fleet of Econolines as installation vehicles. 1st-generation Econolines shared their parts with the Ford Falcon passenger car line, precursor to the game-changing Mustangs. 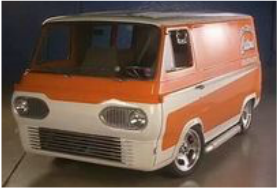 In fact, well-optioned Econoline window vans were marketed under as Ford Falcon vans. The Econolines were available in short-wheelbase or long-wheelbase vans, either with or without side and rear windows. They were also available in a short-wheelbase pickup style. Vans could be ordered with no side cargo doors (nicknamed "no doors") or with two sets on both sides ("eight doors"), both were rare options. Engine sizes varied but only 6-cylinders were available until the second-generation Econolines rolled out in 1968, just in time for the 70s van craze that swept the nation. Aftermarket wheels and tires, side pipes and raising the rear for larger rear tires were common mods for the early Fords. Sunroofs, portholes and roof vents also came into vogue, becoming all the rage by the mid seventies. Ambitious customizers took to grafting Olds Vista Cruiser station wagon roofs onto early vans thereby creating sky views in van roofs, and flared fenders and chin spoilers weren't uncommon. Removing the Econoline's bumpers contributed to a cleaner aesthetic, too. A popular mechanical upgrade consisted of stuffing a Ford 289 or 302 V8 into the early Fords and adding 9" rear ends, which came from the factory in the heavier duty Super Duty models. 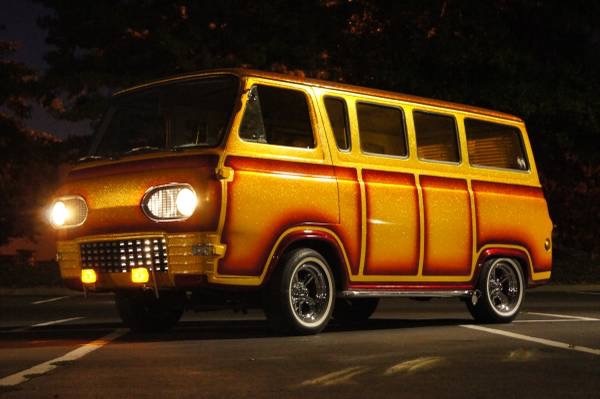 Some early van were chopped or shortened and a few wild early customs vans even had custom noses grafted onto them, a trend that hit with full force with the second- and third-generation body styles. With early seventies emissions, and the insurance industry and EPA putting the kibosh on the muscle car movement, vans became a viable alternative for those with the desire to personalize their vehicles. As the muscle car era came to a close, vans increased in popularity with muscle cars often supplying performance upgrades by way of the salvage yards. As the seventies marched on, you can point to the disco era as the reference for some of the pimped out rigs with wild airbrushed murals and wild interiors that followed. By the late 70s, even the factories got into the game. 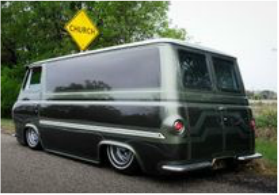 But it was the first-generation vans that started the party.